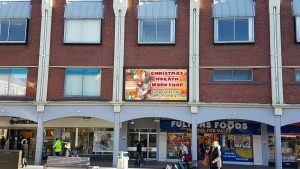 Digital signage supplier and Out Of Home advertiser Review Systems Ltd have recently taken over the prominent LED screen located at Castlegate Shopping Centre in Stockton -on-Tees. The 4 metres by 2 meters screen is installed with a street facing location on the outside of the shopping centre. Overlooking a busy road and pedestrian area, lined with high street brands, the screen offers advertisers an ideal location to target the local residents and businesses of Stockton. The screen orginally installed by Dynamax has been neglected in recent times by the previous advertiser and poor and lacklustre content shown on screen, only served to dissuade brands and local business from advertising. Review Systems have a successful record in providing high impact media content at an affordable price. Within one day of taking over the screen and adding content, new potential advertising brands were calling to get their ads on screen. The new colour rich advertisements and high contrast images, stand out and draw your eyes to engage. The shopping centre also has a number of internal out of date plasma screens and, just like the outdoor LED screen, have suffered from poor media content and poor maintenance. The success of the outdoor screen advertising will also move indoors , with a plan to remove and replace the old existing screens, with new modern equipment and Dynamax’s cloud based digital signage software, digitalsignage.NET to power it all. It’s great to see an advertiser with drive and motivation to get the best out of the equipment and desire to improved and update tired hardware as required. The improvements will not only benefit the brands advertising on screen, but finally after years of neglect the Shopping centre management will feel that they have a partner that can be relied on to keep the display vibrant and up to date. We are one of the longest standing digital signage companies worldwide and for more than a decade we have put every effort into developing best-of-breed digital signage software solutions, able to meet the communication needs of organisations large and small. Here are a few companies that we’ve recently helped with their marcomms. This entry was posted in Retail and tagged advertising, cloud based digital signage, digital signage, Digital signage retail, retail store signage by Dynamax. Bookmark the permalink.